The First Large Scale CRM Plus VRM Business? Nice to see Cheap Energy Club from MoneySavingExpert make it out the door, having worked on that for a big chunk of last year. At first glance it might look like another comparison site, but there’s lots more under the hood – data built on the individual side, automated checking, mi-data ready, and a few more interesting bells and whistles…. Will this be the first service built somewhere between CRM and VRM to run at large scale? It certainly has the possibility to do so; I saved £135 per year on my switch, and others much more. And MoneySavingExpert have a big subscriber base of people who trust their advice. No doubt this will be a story to follow up on…. I spent most of 2012 with head down consulting on a couple of big ‘CRM plus VRM’ propositions – more on those when they show up in the wild. So i’ve been pondering on where to focus on in 2013. I put together this Venn diagram to help think through which areas of our work might reach tipping point in 2013. It looks at the intersection between our three areas of interest – CRM, VRM and Personal Data Services. 1) As an overall theme, I think 2013 will be the year that large organisations with lots of individuals as customers will wake up to the option to build rich, data-driven propositions around volunteered personal information. Critically, this data will being plumbed directly into existing operational CRM systems from ‘something outside’ (whether that be a personal data service, personal cloud, ‘midata’ or some variant thereof) ; Yes CRM plus VRM for real, and built for large scale. The UK midata project, and equivalents elsewhere, will help in that, although more as the spur that makes organisations think about the issue and build their own propositions with the data they hold than about data actually flowing anything like freely. 2) Whilst many/ all of the items on the venn are on their way to a tipping point, some are more ready than others. 3) Offers management, a perhaps obscure, behind the scenes/ yet to really emerge function, will see significant change this year. The current modus operandi of ‘get a contact point and some input data and push offers to it’ has largely run out of road in many key sectors and demographics. The critical aspect of making this happen is that it requires work from both demand and supply sides, i.e. both buyers and sellers. Without both acting together we just get what we have now. We’ll see a number of ways in which I can pull relevant offers via a channel of my choice emerge in the first half of this year, and if well implemented, get momentum in the second half. 4) VRM/ Personal Data Service Hardware. One can get so far with software, but when one adds genuine customer-side hardware to the mix then we get a lot further. So look out for prototypes and then products in that space. So that’s my target for the year – a hardware device that pulls in offers that I have personalised. No doubt it will tackle some other VRM issues along the way. Who Said Privacy Was Dead…..? BT decides against deploying Phorm behavioural tracking. The mobile phone directory Connectivity/ 118800 shut down by pressure from individuals who did not want their details scraped and published. Facebook found to be in breach of Canadian Privacy law. – Facebook fails to put adequate processes around ‘Our Data’ (keeps it for an unlimited period) and thus attracts the attention of a regulator. Exposing these various data grabs is now much more common – because there are now enough people watching and willing to act on it. Privacy is on the way back…..albeit almost from the grave…. This post by Paul Greenberg is the first i’ve read on ‘Social CRM’, and it looks like I came across it at the right time – Paul has drawn a line on what has clearly been a long debate, and set out a detailed definition and description of Social CRM that he will run with. 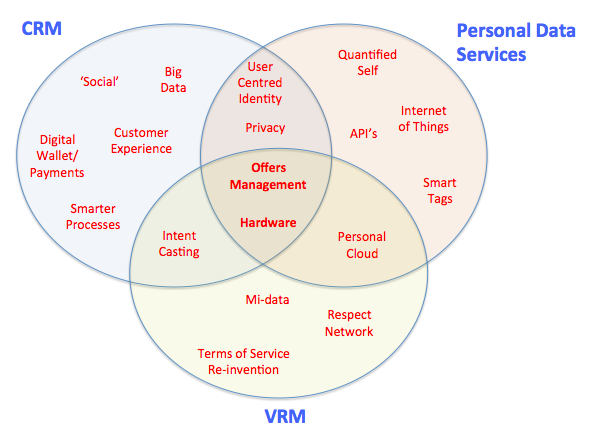 Other than being an excellent summary of what Social CRM is/ is not; the timing works for me, because I think it’s time we in the VRM dialogue start to be more engaged on the mechanics of VRM and how it engages with CRM, rather than the theory of what a VRM world will look like. I say that because it now seems to me, that in UK at least, VRM is a mainstream business/ political discussion – and regarded as a ‘when’ rather than an ‘if’. First, to Paul’s definition – so that we are clear what VRM is engaging with. His definition is below. I’m fine with that definition, but will also set out my own context of where ‘CRM’ (social or otherwise) sits in the wider business eco-system – because that will shape my views as to how VRM will engage. 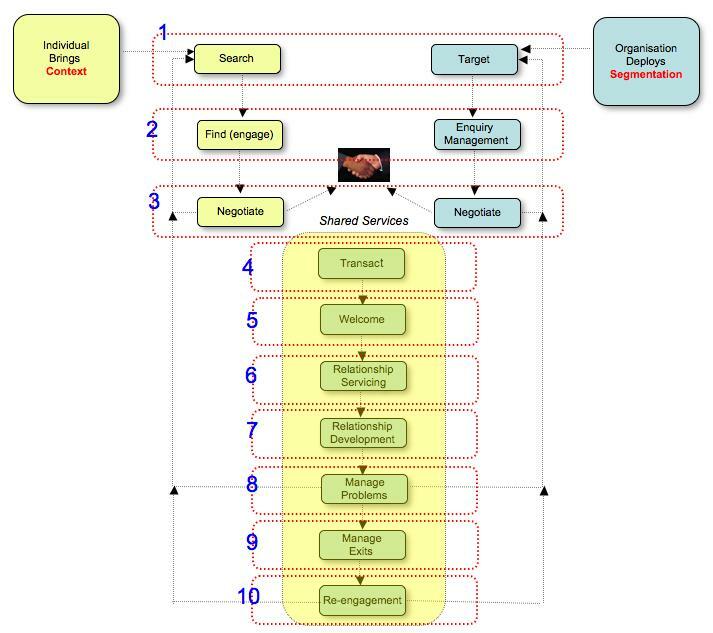 The model below was first developed in 1997 by QCi (since acquired by Ogilvy) and was designed to help clients engage with Customer Management/ Customer Relationship Management – which was then an emerging hot topic. 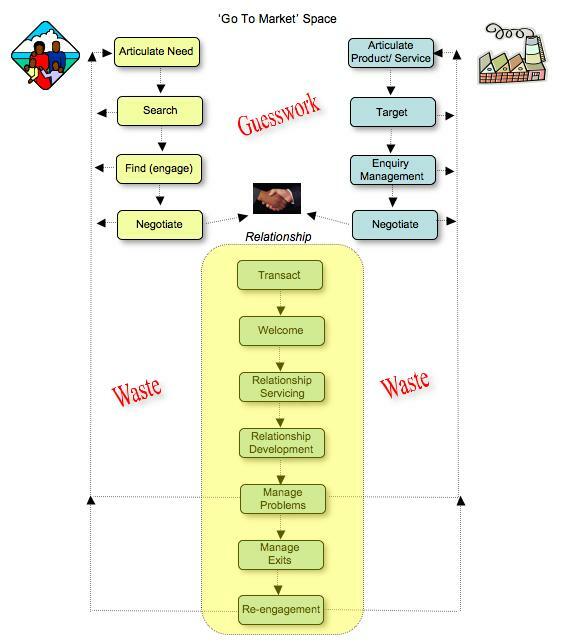 This model has now been used over 900 times in organisations worldwide to assess their customer management capabilities. This model is underpinned by 240 best practices – which have been updated 5 times over the period between ’97 and now – to reflect that best practice is necessarily an evolving beast. So, the model is a good start point – not perfect, and there are others out there, but this is the one i’m working with. Critically – in this model – Customer Relationship Management is central to Customer Management, but the latter is a wider set of capabilities. 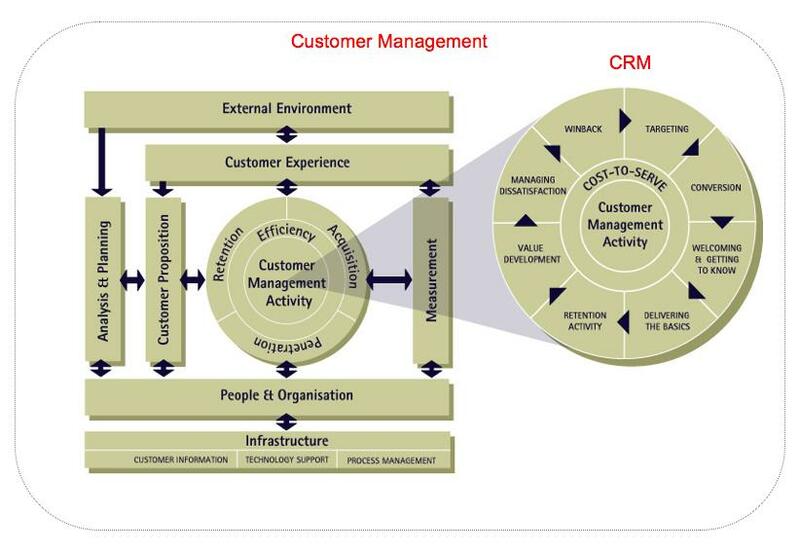 Practically speaking, one can ‘buy/ deploy/ build’ CRM’, but that then has to be seen in the context of the wider business system that is customer management. CRM is optional, Customer Management is not (unless you don’t have any customers….). A perfectly valid assertion from a Customer Management standpoint, in some sectors (e.g. FMCG) could be ‘we don’t want a relationship with our customers, and they don’t want one with us’ – we make stuff, they buy it. I won’t dwell further on this model, other than to say i’ll keep referring back to it in discussions around how VRM applications, tools, processes engage with organisations. – the customer will own (and share) some, not all the data; but that provided by the customer will transform huge chunks of CRM and Customer Management over time. – big chunks of traditional data mining will go away, to be replaced with more value adding data services emerging. – the customer will be the initiator of the majority of CRM processes, and that organisations will becomes much better listeners than they are broadcasters. – the net effect will be the elimination of much guesswork in the pre-transaction component of the customer journey, and much waste from the post-transaction component. This guess work and waste elimination will lead to overall cost reduction, some of which will be shared with the customer who has ‘co-eliminated*’ it. In practical terms, VRM will bring new individual-driven data to the market, and will propose new processes that organisations who wish to become VRM-enabled should engage with. Contractual terms for accessing these data/ processes will also be part of the mix. I’ll build on what I mean by that over the next few weeks. * I’m not sure there is such a word, but it seems a nice counter-point to co-creation.